Did you know that there are 3 main types of insomnia? Did you know that your insomnia then falls into one of two categories? Watch this video where I explain everything you need to discover which type of insomnia you have. 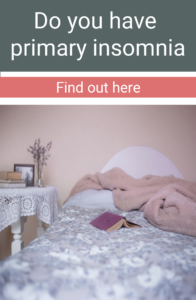 Some people may find their experience of primary insomnia switches between these 3 types. You may feel there is a pattern to your insomnia or there may seem to be no pattern at all. The sleep issues are secondary to another issue. This would be something like a medical problem, a mental health issue or a side effect of medication. This is very common and refers to experiencing more difficulties getting to sleep or waking more frequently on a Sunday night before the start of the working week. If your working pattern is not Monday – Friday, this phenomenon might occur for you on whatever day precedes the start of your week. Although this can be very annoying, it does not usually cause too much distress as sleep the rest of the week is good. Insomnia will either be acute or chronic. This will last for a short period of time. Perhaps a few days or even a few weeks. Acute insomnia will usually occur in response to a major life event or a particularly stressful time. This is very normal and although it can be very annoying, it is not usually anything to worry about and things will return to normal without any treatment. This will be a longer term issue that may have been continuing for months or years. It must have been a problem for longer than a few weeks to be considered chronic. With chronic insomnia, it is common for this to have had further impacts on mood, health and daily functioning. Some people find that chronic insomnia seems to come and go in patches. Some people will describe that they have ‘always been a bad sleeper’.